The bar trade is nothing new: much of what happens behind the bar today will stem from the roots of hundreds of years ago. If you think about it, the art of hospitality dates back to the beginning of human existence. As a human, we make (or at least offer) drinks for family, friends, acquaintances – even our pets! If you’re going to be a bartender (and if you’re a great bartender), then you’re pretty much guaranteed a job for life. Technology isn’t going to kick bartenders out of their job any time soon. While there are always trends in the industry and in technology that might change the way we drink or what we drink, it’s the people serving those drinks that make it special. Of course, different personality types and skill sets will suit different lines of work. Perhaps you’re not sure if this is really for you. Read below our top 6 benefits of bartending to see if you really want to start shaking things up. If you can’t bare the thought of sitting at a desk every day from 9am to 5pm, you’re definitely in the right place! Bartending will have you working many different shifts (mostly nights), and you most definitely will not be sitting down. Studies indicate that sitting for over 8 hours a day is dangerous for your health. Perhaps standing for over 8 hours a day may not be the best for your joints but you’re definitely getting in those recommended 30 minutes a day of exercise! That can’t be a bad thing, right? The bar does not discriminate, it is a place where any one is welcome and any one can walk through those bar doors, regardless of race, ethnicity, religion, age (over 18) or gender. The conversations you have and the people you meet will change from day to day or even hour to hour. If you ask a bartender what their most cherished memory is behind the bar, most of them answer the incredible friendships they made that they wouldn’t have encountered otherwise. You can easily make someones day with just one cocktail, a few minutes of listening or with a compliment. Usually when someone walks into a bar, it’s to have a good time. Whether they are in a good or bad mood, they know they’re going to leave the bar with a smile from ear to ear and you are a part of that! You get to be the person that can instantly make someones day from terrible to great. With a couple of kind words, an exchange of smiles and some drinks, you can help ease the pains of someones long day and create a comfortable experience and environment for them. If you’re a creative person, you’ll understand the incredible feeling you get when you create something beautiful. Creating cocktails is an art in itself, and seeing your hand crafted cocktail sitting in front of your guest who is in awe of the beauty that is before their eyes, is just a fantastic feeling! Think about the colour of the cocktail, the glassware and the garnish and how you can use it all when creating a new drink. You’ll be inviting your High School arts teacher to come and witness your art! Yes, you’ll have a wage where you get money paid into your bank account each week (like every other working human on this earth) but on top of that, the tips bartenders receive could add to your earnings! Working behind a bar is a line of work that has correlation – the greater effort you put into serving your guests and their experience, the possibility of greater financial benefit for you increases. Being a bartender gives you a lot of career options. Have you ever thought about owning your own bar? A lot of bar tenders have the chance to become a bar manager, or even takeover the bar of their retired boss. 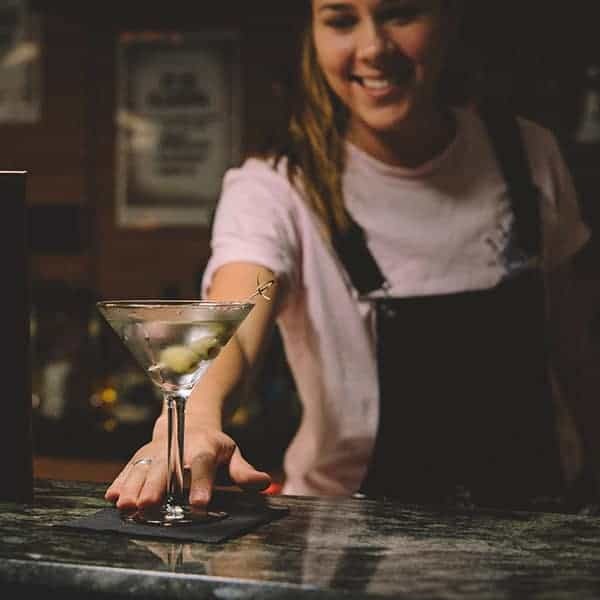 However, if you’d like to eventually move out of the bartender field, there are numerous transferable skills you learn as bartender that employers are looking for, such as team work, communication, numeracy and calmness under pressure to name a few. Are you thinking it’s time to be adventurous and marry some incredible flavours that no one imagined could work? Then you’re in the right place! Check out the bar training​ ​options ​and Responsible Service of Alcohol​ ​course​. Meet you at the bar!